Description: Local | Handmade | Fresh . Cafe serving fresh, handmade cuisine from all over the place , including oir own produced hand raised pies, breaksfasts & burgers . Tony is front of house, whilst his wife, Stani -clearly runs the place! 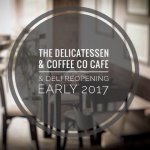 Been to The Delicatessen and Coffee Co. Gabrovo? Share your experiences!